I am so stuffed I could die. As I type, I am entrenched in my chair feeling like the Michelin Man. Whose fault is it? Totally mine. I was so hungry coming home from a terminally boring meeting that I decided to make myself a nice dinner even though it was already past 8. I put together the ingredients of a new recipe I just saw on some website - Fried Pesto Chicken. I adore pesto and if paired with chicken, I would usually grill or saute it. Although I once made a pesto chicken roulade with mozzarella which was quite yummy. Actually I got creative as it was for a dinner party and made a ying/ying chicken roulade entree - one pesto chicken roulade with mozzarella and the other a tapenade basil leave chicken roulade. It turned out really fab and everyone wanted the recipe. I wished I had made that instead of the Fried Pesto Chicken. Oh well, we learn from our mistakes. Fortunately, I had decided to make mash potatoes to go with my fried chicken. I know it is a departure from the usual chips but I had a bad day and I needed comfort day and that means mash potatoes. So, here is what I did to the Fried Pesto Chicken which may have compromised the overall yumminess of this recipe. I used 3 chicken drumsticks which I thawed in a hurry by soaking it in water the moment I got home. Which meant that it was only properly thawing for 30 mins or less. Which then sent me into a panic about salmonella poisoning so I overcompensated by poaching it longer than normal. And also frying it longer than normal just in case ... I am so neurotic sometimes. Thwaps to my friends who are rolling around laughing at the "sometimes" comment. Also, I used a never-tried-before breadcrumbs because I could not find my beloved Progresso Seasoned Breadcrumbs at any of the supermarkets I visited. I had to season the Japanese-brand plain breadcrumbs myself. But I still found it really bland despite adding loads of salt, pepper, chilli powder and tumeric. I could not find my paprika which greatly annoyed me. Note to self: Buy paprika. Call all the supermarkets to find out who has my Progresso breadcrumbs. Am a woman on a mission now. The taste was so-so and I would rate it a mere 6.5/10 and health factor is in the low 5/10. Not the most successful recipe and not one I would really repeat. That's why I thanked my lucky stars I had enough cow sense to make mash potatoes. I decided to make my Dilly Mash, which never fails to cheer me up. 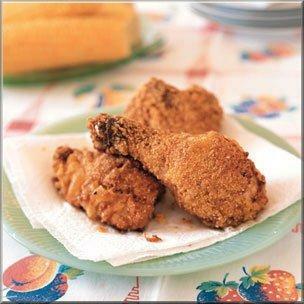 It is fairly easy to make and can be prepared at the same time you make your fried chicken. I am obviously biased since I kinda invented this mash recipe but I rate it 9/10 for taste and about 7/10 for health as I try not to add too much butter and make up for it by usually using flavoured milk. Overall, it took me about 50 mins to cook the two dishes since I did them simultaneously. It might have taken a shorter time if I had used fresh chicken drumsticks and also not been doing my laundry at the same time. I am woman .. I multitask. Since the meal was not the healthiest, I decided to be good and added some arugula leaves to my plate. It is a good combination with the Dilly Mash as the dill and argula really complement each other. The dill's flavour is heightened by the nutty, peppery taste of the arugula and with the creamy & buttery mash, it is a fabulous ambrosia that I cannot resist. I ate the whole lot. I know ... I am a pig. I am so paying for it now as I sit here in a stupour. Tomorrow ... tomorrow I shall be good and make something more healthy. Yeah .... rrrrrright. P/S. Not my photo but something I got off the Web and can't remember the URL now. If this photo belongs to you, do let me know and I will insert the proper attribution.